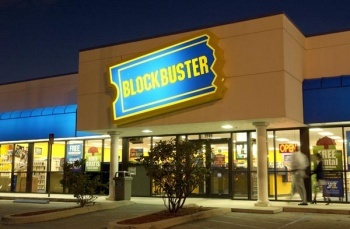 Rumors are swirling that the once-mighty Blockbuster is preparing to file for bankruptcy within the next 30 days. My, how times change. Blockbuster, once the big boy on the video rental block, has fallen on awfully hard times of late. In April of last year the company revealed that it was staggering under a massive debt load of $781 million, and then in September it announced the closure of nearly 1000 stores, a fifth of its overall total. Despite the tough times, bankruptcy may have seemed like a distant and unlikely possibility at the time, but not anymore. A report by Home Media Magazine says the company is expected to announce a "forbearance agreement with select creditors" this week as it gears up to file for bankruptcy within the next month. Blockbuster is preparing a "pre-packaged bankruptcy," which the report says could be a tough sell because it requires that all creditors agree on a strategy that is "mutually beneficial and least disruptive." The company is struggling to keep the lights on as it tries to move away from conventional stores to "a multiplatform distribution strategy." Blockbuster was delisted by the New York Stock Exchange on July 1 and entered into its current forbearance agreement in order to avoid having to fork over a $42 million interest payment, but that agreement is set to expire on August 13. Wedbush Morgan analyst Michael Pachter said he expects the agreement to be extended long enough to allow the company to begin bankruptcy proceedings after it announces its second quarter results after the close of markets on August 12. The forbearance agreement will keep unsecured creditors from triggering provisions that would force a Chapter 7 bankruptcy filing, which would almost certainly lead to the liquidation of the company. There is hope, however; Pachter also said that he believes the company will be able to recapitalize by mid-September and, if everything goes according to plan, may be able to avoid entering bankruptcy protection entirely. Blockbuster recently added a library of over 3000 videogames to its By Mail subscription service. Whether the move was made in time to help bring the company back from the brink remains to be seen.